It seemed like an unwritten rule during Nintendo’s earlier console generations that Kirby was to be the closing act. Kirby’s Adventure was the last great NES game, and Kirby’s Dream Land 3 was the last Nintendo-published title on the SNES. Kirby didn’t quite shut the door on the Nintendo 64, but he still arrived late into the game, with Kirby 64: The Crystal Shards arriving on the console in 2000, four years after the N64 launched, and one year before it was supplanted by the Game Cube. 2000 proved to be something of a banner year for the Nintendo 64, as it also saw the release of Majora’s Mask and Banjo-Tooie, two of the console’s few truly timeless games. While Kirby 64 may not boast the depth of those titles – and may even fall considerably short of the pink hero’s SNES outings – it still fit nicely into a stellar calendar year for the N64. 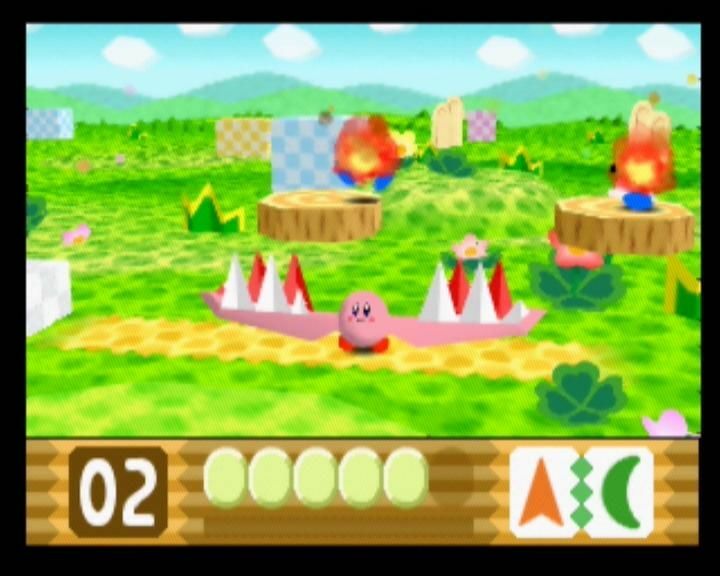 While the Nintendo 64 mostly saw Nintendo’s franchises aiming for a new, 3D perspective, Kirby decided to stick to his two-dimensional, side-scrolling roots (albeit with 3D graphics). Though it may seem a tad disappointing that there’s never been a full-on 3D platformer for the Kirby series, perhaps Hal simply knows something we don’t about how the series would make such a transition. After all, not every series can work in 3D (we all know what happened when Sonic tried his hand at it). Besides, Kirby has always done a fine job at innovating his own formula even in 2D, and Kirby 64 brought one of the best twists to the series: the ability to combine copied powers to form new ones! Kirby 64 utilizes seven base copy abilities. There’s the usual fire, ice, spark, spike, rock and cutter, with the ‘bomb’ power replacing the usual parasol ability in the ‘Dream Land’ lineup. Each of these copy abilities can be combined with the others (including themselves) for a variety of new abilities that are both unique and humorous. Combine bomb with spark, and Kirby becomes an explosive lightbulb. Combine two spikes together and Kirby becomes a Swiss Army Knife. Combine fire and ice and Kirby transforms into an ice block that melts into steam. And in perhaps the best idea for a Kirby power ever, combining spark and cutter results in Kirby wielding a double-sided lightsaber a la Darth Maul. It’s a wonderful take on the classic Kirby formula and, at the time, many figured this would be the direction the series would take going forward. Unfortunately, this ended up being a one-time gig. Squeak Squad would feature a watered down method of combining a small handful of abilities, and Star Allies would add its own twist of combining elements of one power with another. But as far as outright taking two powers and cramming them together to make new powers is concerned, Kirby 64 is it. This is all the more a shame, because not only is the idea one of the best concepts added to the series, but Kirby 64 doesn’t always do the concept justice in how it presents opportunities for these powers to truly shine within the stages. Being the follow-up to Kirby’s Dream Land 3, Kirby 64 follows a similar formula, with hidden trinkets being hidden within the stages (in this case, magic crystal shards). Dark Matter has returned once again, and has conquered the distant planet of Ripple Star, whose now-shattered magic crystal can stop the evil entity. Like Dream Land 3’s Heart Stars, every crystal needs to be uncovered in order to face off with the true final boss and complete the game proper. 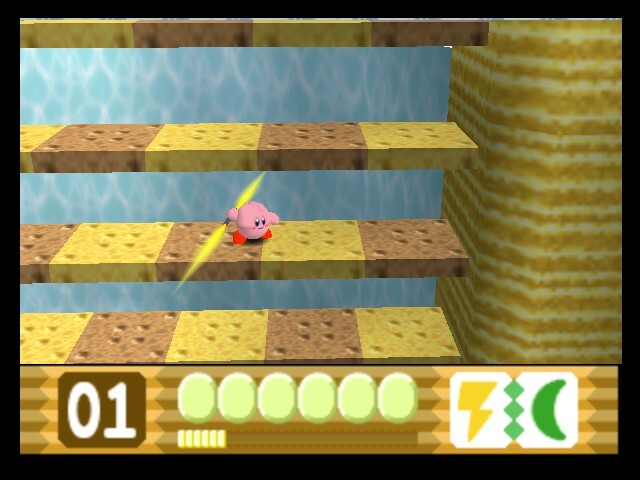 Every stage in Kirby 64 hides three crystals, one of which requires a power combination to unlock. On paper, this may sound like an improvement over Dream Land 3’s ‘one Heart Star per level’ setup. But Dream Land 3 always seemed to find new and creative ways to use its powers and animal friends to uncover those Heart Stars. Kirby 64, on the other hand, rarely has you doing anything other than breaking a wall with a certain ability to claim that hidden crystal. And with the other two crystals on any given stage being barely hidden, there feels like a missed opportunity here in making the level design and power combinations mesh together to make something deeper. Kirby is joined on his adventure by Ribbon, a fairy from Ripple Star, as well as returning characters Waddle Dee, Adeline and King Dedede. Sadly, these allies don’t really provide anything to the gameplay (Adeline sometimes paints a clue towards an upcoming puzzle, but nothing direct). The exception here is King Dedede, whom Kirby can piggyback in certain sections. Sadly, with these segments being few and far between, along with Dedede’s limited abilities, even the good king seems underutilized, which may simply leave you missing the old animal friends (who only show up here in cameo forms via the cutter/rock power combo). Multiplayer shows up in a limited capacity, being relegated to three Mario Party style mini-games (which are fun, but again, there are only three). you’ll probably miss the co-op gameplay found in Kirby’s SNES outings, especially seeing the N64’s emphasis on four-player party games. Even with these shortcomings, Kirby 64: The Crystal Shards is still ultimately a fun game. The different power combinations are always exciting to discover and fun to use, the graphics look as clean and colorful as an N64 side-scroller could, and per the norm, Kirby once again boasts one of his home console’s most terrific but underrated soundtracks, with a number of its original tunes being some of the best in the series (which are thankfully seeing new appreciation with their remixes in more recent titles). The levels even have a fun sense of telling their own little stories, with the progression in each stage directly leading in to the next (the second world sees Kirby traversing a desert/canyon world, which eventually leads him to a spaceship. A little narrative that plays out within the stages of that world). 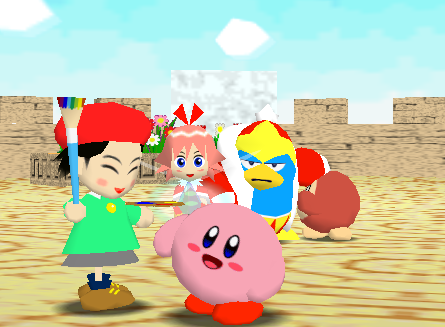 Kirby 64: The Crystal Shards remains a fan favorite for many, due in large part to the ability of combining powers, which remains one of the series’ best ideas. But it does stumble a bit in its execution of that idea, making for a solid entry in the series, if maybe not the most spectacular one.